The 3rd Annual MBI meeting was hosted by the National University of Ireland, Galway at the Hotel Meyrick in Eyre Square from 16th-18th November 2016. 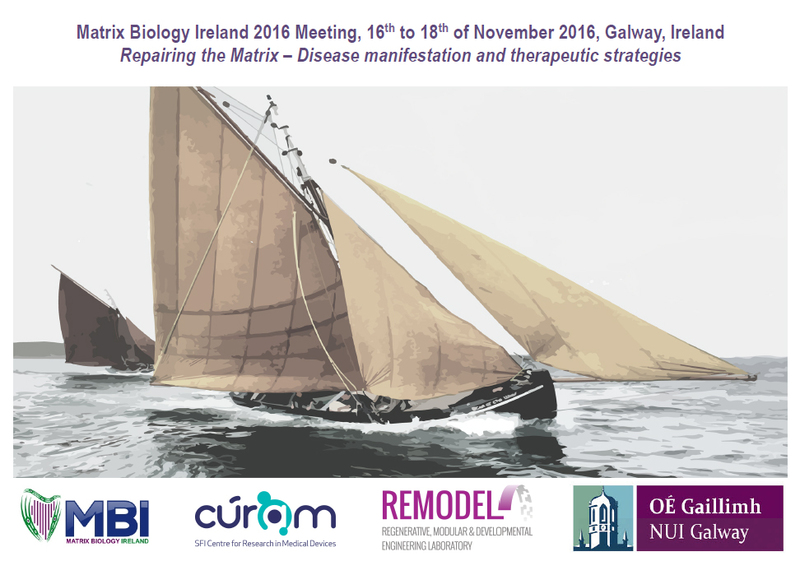 The Regenerative, Modular & Developmental Engineering Laboratory (REMODEL), NUI Galway hosted the third annual meeting of the Matrix Biology Ireland (MBI), from the 16th to the 18th of November 2016. The scope of the meeting was to promote and consolidate scientific interest and expertise around extracellular matrix research in all its forms within Ireland, and, to link this with the international scientific community on Matrix Biology. The theme of this year’s meeting was ‘Repairing the matrix – Disease manifestation and therapeutic strategies’. The meeting was opened by Prof. Pól Ó Dochartaigh (Registrar & Deputy President, NUI Galway) and Prof. Lokesh Joshi (Vice President for Research, NUI Galway), who welcomed the national and international delegates. Prof. Taina Pihlajaniemi (University of Oulu, Finland) delivered the first invited lecture of the meeting; she spoke about using collagens as microenvironmental modulators in healthy and diseased tissues. The first day proceeded to focus on the role of scaffolds in tissue & matrix regeneration with invited speakers including Dr. Petra Mela (RWTH Aachen University, Germany), Dr. Yves Bayon (Medtronic, France), Prof. Mauro Alini (AO Foundation, Switzerland), Prof. Frank Barry (NUI Galway, Ireland), Prof. Daniel Kelly (Trinity College Dublin, Ireland), Prof. Thomas Ritter (NUI Galway, Ireland), Prof. Stavros Taraviras (University of Patras, Greece) and Prof. Eleni Papadaki (Univerity of Crete, Greece). The day ended with a welcome wine reception at the Oyster Bar in the Hotel Meyrick. The second day of the meeting focussed primarily on orthopaedics and cancer, beginning with invited talks from Dr. Manuela Gomes (University of Minho, Portugal), Prof. Denitsa Docheva (Ludwig-Maximilians University of Munich, Germany) and Prof. Tero Jarvinen (University of Tampere, Finland) relating to tendon tissue engineering and regeneration, which were followed later in the day by Dr. Jayesh Dudhia (Royal Veterinary College, UK) and Mr. Stephen Kearns (NUI Galway, Ireland), who provided a clinical insight into tendon repair. Prof. Martin Stoddart (AO Foundation, Switzerland), Prof. Laoise McNamara (NUI Galway, Ireland) and Prof. Caitriona Lally (Trinity Colege Dublin, Ireland) provided insight into the influence of mechanobiology in health and disease. Regarding cancer, invited speakers included Prof. William Gallagher (University College Dublin, Ireland), Dr. Aoife Lowery (University of Limerick, Ireland) and Prof. Caitriona O´Driscoll (University College Cork, Ireland). Prof. Alan Boyde (Queen Mary University London, UK) closed the day with a talk about age and decay in the lumbar vertebral body. The third and final day of the conference covered a wide range of topics (e.g. collagen characterisation, tissue glyco-signature, gene delivery, mechanobiology and numerous pathophysiologies, including Crohn’s disease sndarthritis). Invited talks were delivered by Prof. Tara Moore (Ulster University, UK), Prof. Fergal O’Brien (Royal College of Surgeons in Ireland, Dublin, Ireland), Dr. Michael Monaghan (Trinity College Dublin, Ireland), Dr. Sally Ann Cryan (Royal College of Surgeons Ireland, Dublin, Ireland), Dr. Manus Biggs (NUI Galway, Ireland), Prof. Gerry Wilson (University College Dublin, Ireland), Prof. Laurence Egan (NUI Galway, Ireland), and Dr. Mark Watson (Molecular Medicine Ireland, Ireland). The day ended with a closing statement from Prof. Fabio Quondamatteo (University of Glasgow, UK), who also introduced the new executive committee that will serve from 2017 to 2019. The student prizes were awarded to: Ms. Swarna Raman (NUI Galway, Ireland) for best podium presentation; Ms. Laura Gallagher (Royal College of Surgeons in Ireland, Dublin, Ireland) and Ms. Hollie Allison (NUI Galway, Ireland) for joint runner-up podium presentations; and Ms. Zhuning Wu (NUI Galway, Ireland) for best poster presentation. The MBI 2016 organising committee would like to acknowledge the support of the following sponsors and exhibitors: Biocolor, Santa Cruz Biotechnology, Brennan & Company, Proxy Biomedical and Tendon Therapy Train (Horizon 2020 Project). REMODEL also extend their best wishes for success to MBI and the new executive committee. For further information, please visit the society webpages (www.mbi.ie) and for membership enquiries, please contact the MBI secretary at secretary@mbi.ie.